Below are the results for UFC Fight Night 65 from the Adelaide Entertainment Centre in Adelaide, South Australia, Australia. In the evening’s main event two big men looked to inch closer to a shot at UFC heavyweight gold as Mark Hunt and Stipe Miocic capped off the night. In a strange series of events Hunt never once had the upper hand. For five rounds he was down and it was Miocic who dominated the fight. So much so that doctors had to ask Hunt if he could see and even after he responded “yes” they responded “we know you are a tough but can you continue”? Robert Whittaker could have arguably been the most impressive fighter on the card as he made quick work of Brad Tavares in the main event, KO’ing the Hawaiian at just 44 seconds into the first round. 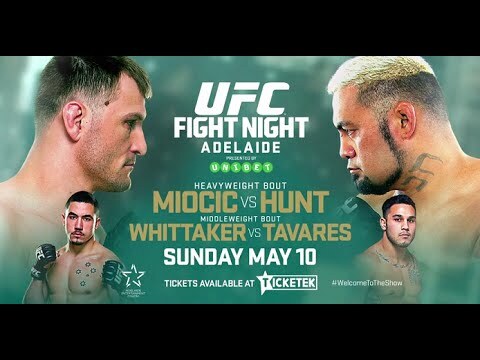 Several Australian fighters to include Anthony Perosh, Kyle Noke, Bec Rawlings and Alex Chambers were on the card and garnered home country support. Unfortunately Perosh however would suffer a first round TKO less than one minute into the first round. His opponent Sean O’Connell might have been the first fighter to plug his novel however in a post fight interview. Recently signed CFFC champ Jonavin Webb made his UFC debut against Noke and it was not without controversy as Webb was near perfect for more than half the fight yet fell on the judges’ scorecard to lose a split decision loss to the Australian. ‘Rowdy Bec’ went to battle with TUF 20 alum and co-star Lisa Ellis and made a statement earning a first round submission victory. Next Metamoris 6 results – Time to reevaluate?